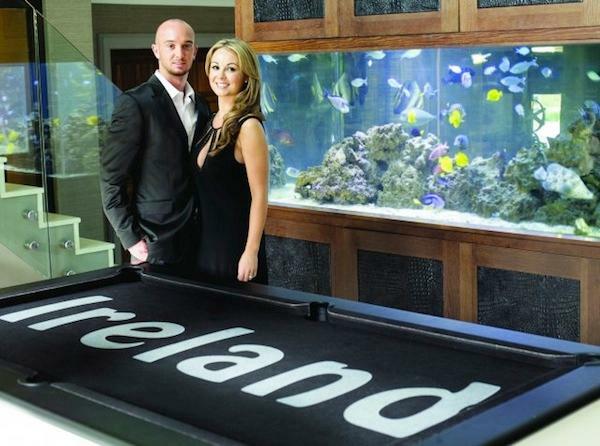 Aston Villa's Stephen Ireland is an unusual fella. He has all those wacky cars, once considered putting a shark tank in his kitchen floor, and revealed himself to be kind of a hypocrite after getting dumped by Man City. Plus, there's that fake dead grandmother business he pulled with the Irish national team years ago. Clearly, this is a man who must have a wonderfully unusual home that you really want to see, even though you know it will probably be a shock to your senses. So come with us now as we explore (via photos from his VIP Magazine spread) the inner-sanctum of the man who just might have the worst taste in football. This is the scene that greets you when you die if you don't repent for your sins. Not only does Steven Ireland have perhaps the most metallic silver comfy chair on the planet, but he even has a turtleneck outfit to kind of match it. The man is like a chameleon with the odd things in his house. Also: their dog is freaking me out. Look at the furry chair Stephen is sitting on. I think it has a googly eye. Indoor pools are always fantastic. Those beams look dangerously tempting to dive off of, though. 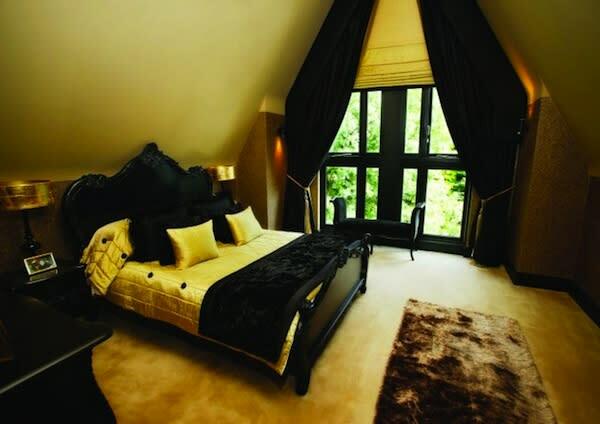 This bedroom might actually be from Tony Montana's house. I think this might have been a mix up. From the outside, it really does look like a nice home with an interesting design. You'd never know that it contains black pool tables with its owner's name on it and googly-eyed chairs. But neither of those things can even begin to compare to the final room we will explore. Beware -- I leave you now with the room that will haunt your dreams and sear your retinas. You are not ready for this, so don't try to pretend like you are. BOOM! Princess room. 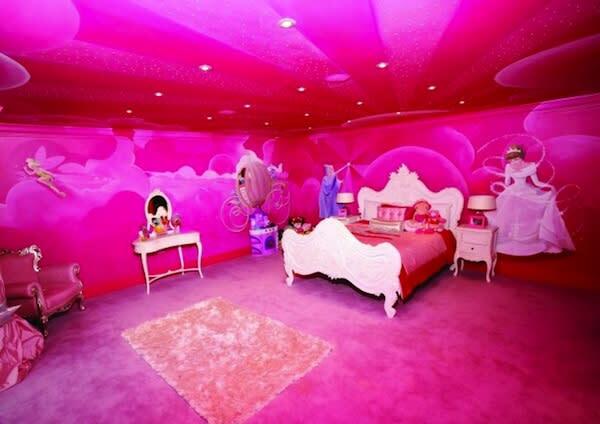 His house has a radioactive pink princess room for his daughter. I'm convinced that spending a night in that room is more panic inducing than a trip to Vegas with Hunter S. Thompson. Look at that thing! LOOK AT IT! While I'm sure most little girls would love to have a princess bedroom, they'd probably prefer to have one that doesn't blind them the second they wake up in the morning. 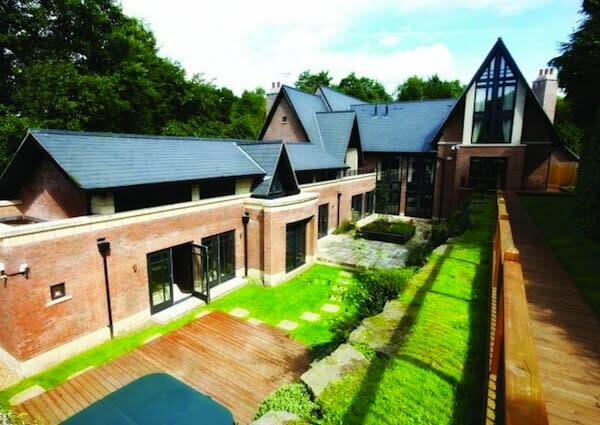 Meanwhile, James Milner just bought a futon and a large spool/coffee table with his Man City money. For more nonsense and ramblings, check out Dirty Tackle on Twitter.